Being a bank holiday weekend we knew what to expect…. wind and rain! We got them both, but not at the same time. 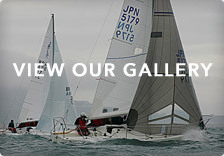 The UK J24 Fleet converged on Parkstone Yacht Club for the late May bank holiday weekend to contest the Southern Areas, however glancing around the boat park whilst final preparations were taking place indications were that things had gone up a gear or two for most teams. Past event winners, Olympic Coaches, Youth, National, European and World champions filled crew spots across the fleet and certainly left you feeling that ,whichever team was to rise to the top, they would have been pushed all the way. As PRO David Lush and his race team readied the course, teams began to familarise themselves with the conditions, knowing that with 5 races scheduled for day 1 and a forecast for a freshening breeze some energy needed to be preserved. Genoa’s were deemed to be the smart choice, however this was to be a brief outing for the shiny sails, with jibs being deployed by race 2 and teams setting in for a day when ‘the breeze’ became ‘the wind’ and ‘the wind’ became ‘strong’! Competition was fierce as always with the U flag quickly replaced by the black one to encourage some semblance of order. Through this two teams showed consistent pace and good decision making and by the end of the day their counting scores each consisted of two 1’s and two 2’s, Duncan McCarthy’s Madeleine and Nick Phillips’ Chaotic. There was however a glimmer of hope for the rest of the teams with both of these standouts holding a high score discard. Behind them the scores were extremely close with many teams showing good pace and boat handling, but not having the ability to punch clear. 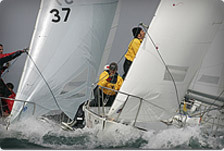 By the time race 5 started we had gusts well into the high 20’s, and had seen high octane planing downwind legs, a few wipeouts, a broken boom, a small altercation between two J24’s and the committee boat and a growing collection of bumps and bruises, which are the J24 sailors badges of honor! After an evening recovering in front of the America’s Cup day 2 offered a much gentler face of Poole Bay. Teams headed out knowing that they would need to do something special to upset the top two, and only then if assisted by a capitulation or match race between Messer’s Phillips and McCarthy allowing the rest of the fleet to sneak through. Unfortunately for the hopeful this was not to be, and despite Andy Taylor’s Phoenix team posting a 1,1,2 for the day they were only able to secure the bottom step of the podium. Silver medal went to Madeleine, who presumably rued the keen eye of Saturday’s race team with their Black Flag. However, having compiled the scores it was clear the top step belonged to Nick Phillips and his Chaotic team of Jules Scott, Rachel Montgomery, Matt Hardy and Hugh Styles. With only one counting score outside the top 2 their consistent pace and good decision making made them worthy champions. The next event on the calendar are the UK Nationals to be hosted by the RWYC in Plymouth in July, however before that a number of the British teams are heading to Germany for Kiel Week.